Rollerblade USA is warning consumers that some of its Spark and Spitfire inline skates might have loose frames and wheels that could cause falls, according to the U.S. Consumer Products Safety Commission. Consumers should stop using the skates, then check all the wheel-axle and frame-mounting bolts and make sure they are tight. Rollerblade received 31 reports of loose bolts, including one from a consumer who fell and needed medical attention for minor injuries. The company said it posted a video on its web site showing how to properly tighten the bolts. Once tightened, the skates are safe to use again. 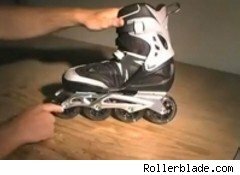 The skates cost $80 to $160 and about 29,000 pairs were sold on the Internet and in sporting goods stores nationwide from September 2009 to July 2010. The skates were made in Thailand, Vietnam and China. Consumers can call the company at (800) 232-7655 between 9 a.m. and 5 p.m. Eastern, Monday through Friday, or visit its site.